SAN FRANCISCO — Join the Japanese Cultural and Community Center of Northern California on Tuesday, May 10, at 7:15 p.m. to cheer on the San Francisco Giants as they play against the Toronto Blue Jays. The Giants will be celebrating Japanese Heritage Night with cultural performances to entertain the fans at a pre-game festival, along with a limited-edition, Japanese-themed Giants T-shirt. 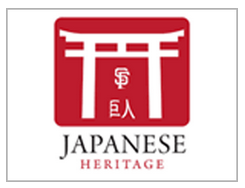 A ticket purchased through the JCCCNC includes a seat in the designated JCCCNC section, the T-shirt and admission into the pre-game Japanese Heritage Night Festival in Seals Plaza. A portion of ticket sale proceeds will go toward supporting the JCCCNC. Tickets are $25 for JCCCNC members and $30 for non-members. Groups of 15 or more qualify for JCCCNC member rates. Seating is limited. To purchase tickets or for more information about Japanese Heritage Night with the JCCCNC, visit www.jcccnc.org/membership/special-promotions.